A Middle-aged Pensioner | The greatest WordPress.com site in all the land! I had intended to post regularly this year, but as is patently obvious this hasn’t been achieved. Now I’m not going to berate myself for breaking this intention. It’s been a funny year – unsettled, rather than ‘funny’. I’ve spent most of it feeling as if I was waiting for something to happen; I’ve put it down to grieving – the dread of all those first anniversaries. Now they’re past though. And my brothers and I finally scattered my Mum’s ashes – nearby, so I can go and visit the spot as frequently as needed. It has given closure of a sort; I’m relieved that she’s been set free. I could almost hear Mum saying it was about time the coffer was emptied. That sounds peculiar doesn’t it? Nothing about loss is normal though; of that I’m sure. So, my purpose of the last year has come to a conclusion. Now what? Well, I tried to move house (again) and failed (again!). My daily walks with Malin, my dog, continue and there’s a post every day on Facebook to document it. It’s coming up to two-thirds of the way through the year. That’s almost 244 posts. I’ve enjoyed documenting each day even if sometimes folk look at me strangely while I’m trying to get an interesting dog’s eye picture of the world. We’ve also taken further dog training classes after Malin squeezed through a fence onto a dual carriageway. Thankfully, the traffic stopped and a driver caught her before anything awful happened. We’ve been working on her recall and my capabilities to control her. I’m pleased to say that we passed the course we took and I now have the application form for Pets as Therapy. Despite having a mischievous streak, Malin has a fantastic temperament and adores people; I’m wondering if we’d both get a lot from volunteering for the charity, if we’re accepted. Health-wise, it’s been a bit hit and miss. For a few months, my right hand side appeared to be on a different time zone to the rest of me – it was lagging behind. This made walking difficult so the solution was to be quite mindful – concentrate on each step. Still, my body seems to be back in sync again which is a relief. I think walking each day helped greatly. That and the yoga classes which I’ve also started. The classes are small and the teacher is fabulous. On a good note, I’m encouraged that I’m more flexible than I thought I was; on a slightly bad note, it’s quite obvious what damage the MS has done. Still, being pragmatic, it’s twenty years since I was diagnosed, so it’s no surprise. I haven’t yet got around to the riding. But that’s still planned – four more months to do something about that. Or, as I turned fifty this year, it could be one of the things I do before I turn fifty-one. Does that smack of an excuse??? My main achievement this year is that I’ve written a novel – all fifty-seven thousand, nine hundred and sixty-two words of it. Now I’m not saying it’s a prize winner or even likely that it will be published, but I always wondered if I had a novel in me. Seems I did – maybe not quite the one I hoped for, but nevertheless, still a book. The act of writing has been more of an undertaking than I anticipated. Some days, I only managed half an hour before my brain seized. On good days, I managed bursts of activity interspersed with rest periods. Toward the end of the novel, I was planning my day so that I could write, walk, complete chores, rest and watch some of the action from the Rio Olympics. Will I write another one? Well, I do have a fledgling idea which won’t go away…. Now, I like to think that I’m a pretty steady sort of person, I like order and I don’t mind routine. But…sometimes, because it feels as though the MS imposes a particular way of life, I start to get contrary. That’s what has been going on over the last year or so – small acts of rebellion against a neurological condition. This attitude, combined with the need to deal with the events of the last year too, had meant I’d become pretty slack at managing “my spoons”. What a relief that realisation was (although I also gave myself a good kicking too for being so stupid); now I could finally start getting back on track. So, how to do this? Well, I decided that I needed to stop battling with the disease and to start working with it – an approach that I had consciously taken some time ago, but had let fall by the wayside (there definitely is a theme here, isn’t there?) So, time to get back to basics which I’ve grouped into four themes. Perhaps this is the most important theme of all for me at present, so I’ve reviewed and re-read the material I’ve gathered over the years about how to deal with the symptoms that I experience. Some of the tools I’ve used in the past to help me manage were still ticking along and helping. However, I realised that I’d become lax with regard to my diet, meditating and good sleep hygiene. Reverting back to better habits wasn’t too much of a chore and already I feel happier for doing so. I had an MRI scan back in the autumn and hadn’t heard anything from my Neurologist about the results. I finally got around to making some calls, only to discover that the results had been waiting at my G.P.’s for some weeks. As it happens, this was a golden opportunity. It would be very easy to blame all my ailments on the MS – easy, but wrong. Luckily, I have a very approachable, thorough Doctor who doesn’t jump to MS conclusions either. Cue a full suite of blood tests booked for next week; confirmation that my blood pressure is normal, but consistently on the low side of normal so something to be aware of, but not worried about; and feedback on the scan results (no new damage in the hemispheres; a little inconclusive in the spinal cord; no current activity lighting up the scans – phew!). There are those people that don’t like to be alone, and there are those that are fine with it. I fall into the latter category. Of course, I’d like to share my life with someone, but it’s not happened (dating with MS is a topic ripe for a future blog I think). What does this have to do with getting back to basics? Well, I’ve been feeling quite vulnerable recently, so I was wondering how to counteract that? Solution, figure out what comfort blankets I need. The first blanket has taken the form of setting up Lasting Power of Attorneys (which I’m guessing applies to the U.K – although Scotland has different laws I believe – and not another country, if you happen to be in one dear Reader.). These are legal documents that would come into force if I were to become incapable of making decisions; I can nominate others to manage my finance & property and to make decisions about my welfare on my behalf. To my mind, it’s the practicalities taken care of, just in case. My second blanket concerns the current aspects of financial security; I have no-one else to rely on and the chances of winning the lottery are slim. So, sensibly, I’ve conducted a financial health-check, made a few tweaks, and now have a revised budget and plan. When I was first diagnosed with MS (20 years this June), the Neurologist didn’t give me much advice, except to always have something to look forward to – every 3 months, plan an event, outing, trip, anything to keep looking forward. I used to follow his advice religiously, booking leave from work every quarter. Since retirement, I haven’t been doing this; I suppose it’s because I hadn’t adjusted my expectations in line with my capabilities. However, even the simplest events can be tailored. As a starter, I’m taking a photograph of the daily walks I take with Malin and then posting it on Facebook. It’s such a simple idea – a good way of letting family and friends know I’m okay (they’ll be able to check whether I’ve posted or not) and a great incentive to explore new walks and to pay attention to what’s happening when we’re out. Even more so, it’s helped to turn my attention to what else to look forward to. There’s a local Riding for the Disabled centre that’s caught my eye – if not to get back to horse-riding, then maybe to volunteer somehow. I think I mentioned before that I’ve been getting irritable and ratty, which is not like me. On a walk with Malin, I found myself getting worked-up that she was pulling on her lead. When I stopped to think about it, it dawned on me that I was worried about hurting her, being pulled over on the slippery path and also frustrated that I didn’t know how to solve the problem. 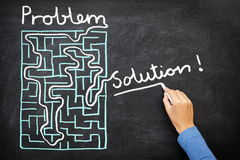 Here’s the thing – I did know how to resolve the situation; the trouble was I wanted an instant solution when what was needed most of all was time and patience. Have you guessed where I’m going with this? It wasn’t just Malin bearing the brunt of my impatience – it was self-directed too. I wanted an instant remedy to how I’d been feeling. To test out my theory regarding this Basic, I started with Malin. I re-read the techniques I’d be shown when we attended Puppy School, then put them into practice, trying hard to be patient about our progress. It’s working – some days are better than others and I’m fairly confident that anyone watching our walks wonders why I keep stopping and starting. But it doesn’t matter – what matters is that I’m finding my patience again and my wonderful little dog is happily trotting along at my side – most of the time! The festive period has been and gone; how was it for you? There was no doubting that this Christmas was going to be strange given that it was the first without Mum. During December, I was acutely aware of her absence; and the whole period felt unreal. Although I’d spent Christmas Days without seeing her before, the arrangements had always been out of choice, either hers or mine. This time, obviously, that choice was denied to us both and that did grate. Now I should admit that I have very mixed feelings about this time of year. I’m not a big fan of the commercial aspects and the feeling of hysteria that arises in the pursuit of a “perfect Christmas”. I was extremely irked that adverts for Christmas started being shown on T.V. the day after Remembrance Sunday. Seriously, isn’t that rather disrespectful? I appreciate that it’s a valuable time of year for companies and they will do anything in their power to persuade us to shop with them. However, I find the images of faux families all having a wonderful time, gorging themselves on food while looking stunning in their festive outfits just too unrealistic and a cynical manipulation by advertisers. Consequently, I was feeling very “Bah humbug”-ish; telling several people I thought it would be a good idea for Christmas to be aligned to the Olympics and held once every four years. 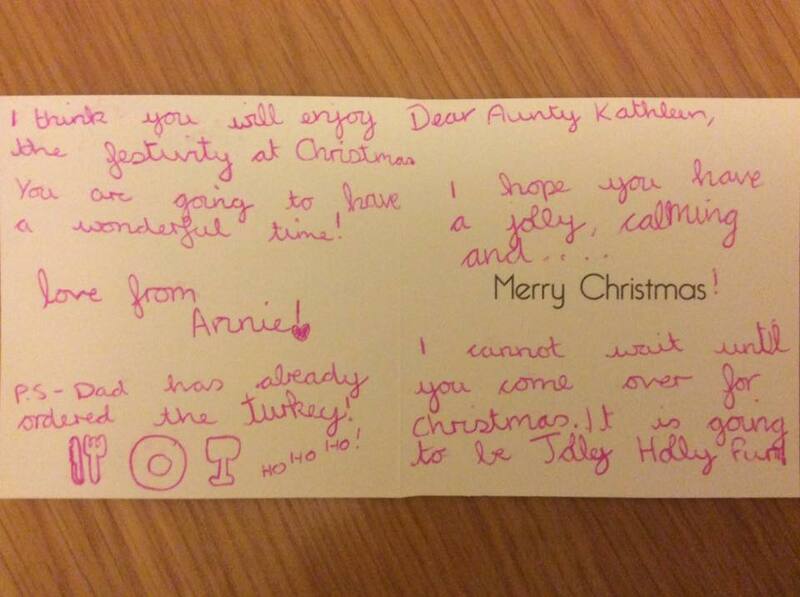 Luckily, niece number five (of six) sent me a Christmas card that made me realise what an idiot I was being. Annie is nine years old but has an emotional intelligence far beyond her years (and yes, I know I would say that, but in this instance it’s the truth not just an Aunt’s boast). She had obviously considered how it would be without her Nan, but more than that, she’d put herself in my shoes and went to the trouble of showing that she empathised. Fabulous, isn’t it? But that wasn’t all. My younger brother told me that she’d put a special request regarding Christmas Day in her letter to Father Christmas. I won’t share it here, because her wish is between her and Santa; suffice to say, it brought a tear to my eye and a lump to the throat. So, feeling as though as I was in my own version of It’s A Wonderful Life, I bucked up my ideas and focussed on the true meaning of Christmas. Which is why I was so mortified by my behaviour. Okay, confession time. Well, not so much confession as explanation. After a really lovely, busy Christmas Day and evening at my younger brother’s and sister-in-law’s home, I suddenly had an issue with my MS symptoms. Picture, if you will, a cartoon character where the colour is shown literally draining from them. That’s how it feels – as well as the colour draining, it feels as though everything is seeking release, if you catch my drift. Cue a very swift exit from the room in search of the nearest bathroom. Followed by a lie down on niece number four’s bed whilst my brain attempted to catch up with what had happened and to restore normal physical activity. This is when I panicked; I truly believed that I had to get home as a relapse was starting and if I waited until morning, I wouldn’t be able to travel. Clearly I was not thinking rationally (sadly, I don’t think this can be wholly attributed to the MS; it was fear) and so I caused a fuss. I gathered my belongings and loaded them and the dog in to the car, all the while protesting that it would be better to drive home on Christmas Day evening – after all it had stopped raining and the traffic would be light – despite everyone else’s obvious concern. Luckily I don’t drink too much alcohol these days, so I was stone cold sober; however, I also don’t drive too far or very often at all at night – the oncoming headlights and general darkness being difficult for my eyesight / brain to cope with, plus I’d already driven for an hour and a half earlier that day and that is my limit due to the fatigue it results in. With hindsight – well, pretty soon after I’d left – the stupidity of my actions dawned on me. It was actually when my brain finally caught up with everything that was going on and a modicum of logic and rational thought was restored – about the time I reached the Hogs Back heading to Guildford. By then, it was too late as I didn’t know the way back to my brother’s if I left the road I was on, so I had to continue home. Someone was looking out for me that night to be sure. On arriving home, all hell let loose emotion wise – shock, relief, fear, shame….you name it, I felt it. Mostly though, shame. Primarily for acting in a way that spoiled Annie’s efforts to ensure we had a lovely day; and secondly, because I hadn’t realised how ashamed I am of having MS and how I so often fail to manage its symptoms appropriately when I’m with other people, and especially when I’m with family. I hadn’t been able to articulate before how ashamed I feel; it’s an odd reaction to have especially when I didn’t choose to have a neurological condition. I wonder if it comes from a childhood when I was told not to make a fuss, not to show-off. Making a fuss mortifies me; passive aggression is much more my style, but it doesn’t work with a disease. I know that I should have said earlier on Christmas Day that there were elements I wasn’t coping with – that was the really foolish thing I did. In trying not to make a fuss, I made an even bigger bother later. I need to come up with something utterly marvellous to make it up to Annie, even though she won’t expect me to do so. What are we going to do now??? Following on from my last post, I’ve been wondering about the direction my life is taking and what plans I have made. My life is rather aimless at present. This is the first time where I have no-one else’s needs to consider apart from my own. It’s rather freaking me out if I’m honest. I admire folk who have a life plan and know where they will be in five, ten, fifteen plus years. I’ve never done that; I had some assumptions about how I hoped my life would be and some of those ideas have been realised and some not at all. But, as for having a plan? Nope; every time I tried to develop one, it seemed Fate had other ideas. So you’d think that I would be quite comfortable at present; coasting along, pottering from one thing to the next. But….I’m not at all. Hence, why I’m now freaking out. Reflecting on the events of the past few years, it’s really no surprise that I’m feeling this way. I’ve experienced some major life changes what with progression of the MS, retiring from work and, most recently, the death of my Mum. Before this bereavement, I was trying to find a new purpose – it probably explains the decision to try and move house. Here I am, another year on, still puzzling about what to do with my life. At the risk of sounding morbid, I probably have 30 – 35 years ahead of me. I’m certainly on the downward slope of the hill which focuses the mind somewhat. The more I think about it and all its aspects, the further away I get from making a decision and a plan. It terrifies me that I’m going to fritter away my life; I already have some significant regrets – I certainly don’t want to add to them. So, the question remains: what am I going to do now? I suppose that at least it’s the perfect time of year for this type of reflection – the New Year is tantalising close, with the prospect of making some proper resolutions – and the fruits of the spring–clean & de-cluttering I embarked on as part of my mourning process have resulted in a house & garden that are in tip-top shape to go on the market if moving is part of my future. I’m also writing again (it has taken me months to be calm enough to do so); one of my poems has been published as part of an anthology, and I was invited, by my cousin Jo, to write a guest post for The Write Romantics blog. I’ve also submitted a short story to a magazine and have been planning the novel I’ve had on the go for some time now. It appears then that finding a solution to the puzzle is very much a work in progress. I apologise if I’ve sounded like a spoiled, middle-aged woman with too much time on her hands. Sadly, I probably am at present…at least that’s one thing about which I can be certain! Yesterday was the anniversary of my last blog post. I’ve just been re-reading it; there was excitement and a touch of guilt about the plans that I had been making. Most of all though, I was reaching out to the future – feeling that I could make a positive change to my life. Well – it didn’t quite turn out the way that I’d hoped (true British understatement there.) Let me bring you up to speed with what occurred. Firstly, the plan to move house did not come to fruition. Despite being on the market for four months, the house had three viewings and one ridiculous offer. The Estate Agents were utterly baffled and remain so. Whenever they see me, they still shake their heads wryly at the memory. I didn’t even need to withdraw the offer on the cottage – as the vendors found a house they wanted, we agreed that they could put the cottage back on the market and if mine sold, then all well & good. It didn’t & they received an offer from someone else very quickly. The sale went through and the cottage is now home to a new family. I did look at a few other houses in the New Year, this time nearer to my Mum. As fast as I could enquire about them, they were sold – once on the day before I actually had a viewing. By this time, I began to think that Fate was seriously trying to tell me that now was not the time to move – anywhere. This dawning realisation was heightened by the shock of my Mum having been admitted to hospital six days before the house came off the market. She hadn’t been feeling well since shortly after Christmas, struggling with her lung condition – idiopathic Pulmonary Fibrosis. An unpleasant disease which left her exhausted; unable to enjoy even the simplest of activities and prone to some vicious chest infections. It was a sign of how awful she felt that she allowed the emergency services to be called – she had a morbid fear of hospitals and would do anything to avoid them. I arrived at A&E (ER for any American readers) to find her attached to a monitor and her face covered with an oxygen mask. I know that hospital lighting isn’t the best in the world, but to see her looking so grey & small was horrifying. However, she was quite cheery in herself, singing the praises of the Ambulance crew, excited that she’d been rushed to hospital with blue lights flashing & sirens wailing, and relieved that there was something really rather wrong with her which was challenging the medical team. Eventually we were told by a Cardiologist that Mum’s heart was beating way, way too fast and that there were problems stabilising it – they were struggling to get the BPM under 130. Mum was bemused; she was breathing more easily than recently because of the oxygen, and hadn’t had any of the sensations that the doctors said were symptomatic of Atrial Fibrillation, which is what was diagnosed. With the benefit of hindsight and Google search, I now know that this was not good news. The combination of her lung condition and signs of her heart weakening were red flags. At the time though, I naively assumed that all would be, if not well, then manageable. No doubt in the future I will write about the events in the months following February, doing so out of love and affection, remembering the humour and the heartbreak of caring for Mum until her death in June. But at the moment I can’t; even typing this brief recollection, I feel as though I’ve been winded by a punch in the stomach. Grief – it’s a peculiar thing. A friend once wrote in an autograph book of mine “Expect the unexpected.” If I’d remembered this piece of advice, I wouldn’t be so shocked that I have packed the contents of a home this year. Just not the one I’d planned. And in the words of Spike Milligan…what are we going to do now???? What a difference a couple of weeks makes. As I posted in the last blog, I was waiting to make a further offer on the cottage I’d seen. I duly did so, and received a counter offer from the vendors. Unfortunately this exceeded what I was prepared to spend, so I declined and wished them a speedy sale. I didn’t hear anything for a week by which time I’d resigned myself to not moving and looked on the positive side about the money I wouldn’t need to spend on fees, duties etc.. Then last Thursday when out walking with Malin, I received a call from the Estate Agents to let me know that the vendors had accepted my offer and were granting me a period of exclusivity to sell my house. I was flabbergasted and utterly delighted. Very quickly my house was put on the market and a viewing conducted within the first few days (nothing came of it though). 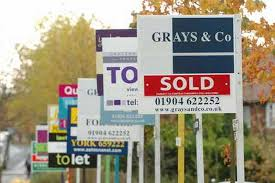 Also the neighbours know that I may be moving – in a village this size, the Estate Agent is known and was spotted. Which brings me on to my topic – the emotions of moving. Oddly enough I feel guilty about it. Partially this is down to Benny, my cat who sadly died in August. If he’d been alive, the prospect of moving home would have been difficult – he wouldn’t have dealt with the change at all well and I couldn’t have considered the house as it’s on a lane. I feel as though I’m capitalising on his death – doing something I couldn’t have done if he’d been alive. Partly, the reaction from the neighbours, especially my immediate neighbour who didn’t hesitate to tell me that I was making a huge mistake, that the cottage was dreadful and that I’d regret it. As he’s just lost his wife, I didn’t tell him that actually it was none of his business. His reaction shouldn’t affect my decision, but it’s re-enforced those feelings of guilt that I’m potentially leaving (somehow it’s a rejection of them) and now I feel responsible for finding a buyer who will fit in and not aggravate the Close. Of course, I’m also wondering if I’m being selfish; I ought to move nearer to my Mum who’s having health problems and needs support. We have discussed it and she doesn’t want to be selfish asking me to move nearer to her, away from my friends and the support network that I have built up over the years. It’s daft isn’t it? I’ve started to justify why I want to move, and it’s made me anxious because the reasons don’t sound compelling enough! Still, I’m getting ahead of myself – there’s a lot that will need to happen before a move actually occurs. The good thing is that I’ve recognised that I need to calm down and stop thinking of all the things that will need to happen; rather focus on the immediate activities – so I have contacted my mortgage provider and my Financial Adviser to ensure that the finances are in order. I’ve also created a spreadsheet (oh the joy of spreadsheets) with budget, costs et al. If I start to have sleepless nights, I’ll augment this with a plan of action. It’s no wonder that moving home is considered as one of the stressful life events. I know I have to be careful too because stress and MS don’t make happy bedfellows; but life simply can’t be lived without an element of stress. Oddly enough, the move is also motivated in part from fear – believe me, this was a peculiar revelation when I recognised it. It occurred to me that I could be very comfortable letting the months and years slip by staying where I was, watching as others come and go. But I found myself asking: Is this it? I’m fearful that it could be unless I do something about it. I may be retired, but I’m still young(ish) – I need to climb out of the rut I’m very much in danger of being buried in and experience again that frisson of excitement that results from being challenged. Perhaps this is my midlife crisis – a typical English middle-aged woman one that has manifested itself as a desire to have a puppy and a cottage with a walled garden! I was once asked if I used having MS as an excuse not to live life. I never did, but due to what’s happened over the last few years, sadly, I think that I have been guilty of wrapping up in cotton wool and doing nothing for fear of the consequences. But now I see that that’s no way to live. One of the aspects of having a condition such as MS is how constraining it can be. This, coupled with my aversion to risk taking and general need to keep the status quo, means that I haven’t moved house in twenty years. Now, granted – there’s nothing particularly odd about remaining in a home for this length of time, but it surprises me every time I think about it, as growing up, my family never stayed put for more than five years in one place. From around the fifth anniversary of living in my house, I’ve been contemplating moving. Marriage, divorce, changes of job, parental illness – all have prompted me to re-consider. I’ve even gone so far as having the house on the market once or twice. Since retiring though, I’ve been seriously wondering what to do; I no longer have to live where I do for commuting purposes, so where do I want to live? I began to list all the places in the country which appealed and started to randomly search for properties in those counties to see what I could afford. I whiled away far too many hours on the internet looking at houses. The odd thing is that although on one hand it was exciting to imagine all the possibilities, on the other, I began to feel very rootless which in turn led to increasing sentimentality about where I live currently. I hadn’t realised how established in the village I’d become. Now, if you’re of a fatalistic turn of mind (as I tend to be) you won’t be surprised to read that just as I’d figured this out, I saw a For Sale sign on a house in the village. This led me to the relevant website and there I spotted a cottage for sale that I’ve always admired (the sort of admiration I reserved for the boy two years ahead of me at school – serious reverence.) Before I could stop to talk myself out of it, I called the agents and arranged a viewing. Two viewings later I am smitten; waiting for tomorrow when I can submit a revised offer and hope that the viewings booked by others come to naught. So what if I am successful (and I realise I am a long way off from that point)? Now, this is where I come back to my original point about the constraints of MS. Sometimes, I have to have faith that although it will be a monumental undertaking for me to move home, all will be well. I could easily stay where I am, and if the sale doesn’t happen, then I have a lovely house. But….the cottage has revealed a passion that I hadn’t acknowledged before – I’m a homemaker; I enjoy domesticity; my home is my sanctuary and this is especially important as I’m on my own. I want to create a home that is all mine and has no associations with it. I can picture so clearly the cats, dog & I in the cottage, that I’m worrying that I’m setting myself up for a fall. Well, que sera, sera and I’ll keep my fingers crossed. And if it does work out, then I’ll worry about how to actually move home and manage the MS.
kepatersonagain on Back to Basics….